We’ve already covered a lot of ground in our SEO 101 series, explaining how Google uses small bits of automated software to scan and analyze websites, as well as what you can do to make your own pages easier to find and understand. When it comes to the reasons search engines have to prefer one website over another, however, not everything comes down to the text that’s on your page. That’s still the biggest factor, but it’s not the only one. After all, Google has to have a way of separating two websites with similar content and keywords. Just think of all the different pizza places or accountants, for example, that could have websites in a given area. How do search engines decide which ones are given a priority? Beyond the content on the websites themselves, it often comes down to context and authority. Let’s take a quick look at each one. Psychologists will tell you that context and nonverbal communication are actually key to the way humans interact with and understand one another. Google can’t read your facial expressions or tone of voice (yet), but it can use context to try to figure out what you’re actually looking for, even if the piece of information you want doesn’t exactly match your search string. For example, if you type in a question about a baseball player, it may steer you to a site with a matching keyword and a lot of other baseball-related facts and articles. Additionally, it may consider other websites you’ve recently searched, or topics you’ve been looking for more information on, along with your geographic location, preferred language, and other demographic data to try to sort out a set of results that are most meaningful to you. This is incredibly helpful as a searcher, but it has important implications for marketers, too. The more useful your website is as a whole – meaning the more pieces of interesting and unique content it has – the more potential it has to answer questions. So in that sense, context is all about identifying your location and having lots of great content. If context is all about delivering the best match, authority is about finding the most trustworthy answers. To help searchers get the right answers to their questions, and not just the best keyword matches, Google has to consider the authority of your website. Authority is built and demonstrated in a few ways: by having other respected websites link to yours, with lots of social activity, and by having an abundance of recent, unique, and in-depth articles (usually in the form of a blog). With all of these factors in place, Google can feel confident that you know what you’re talking about and are a relevant source of information on your topic or industry. Then, it can begin to favor your website over the competition. Context and authority aren’t quite as straightforward as things like keyword placement are, but they are important to understand and take advantage of if you want to rank highly in a market with lots of different competitors. In the final installment of our SEO 101 series, we’ll take things further and look at some of the newer trends in search engine optimization. 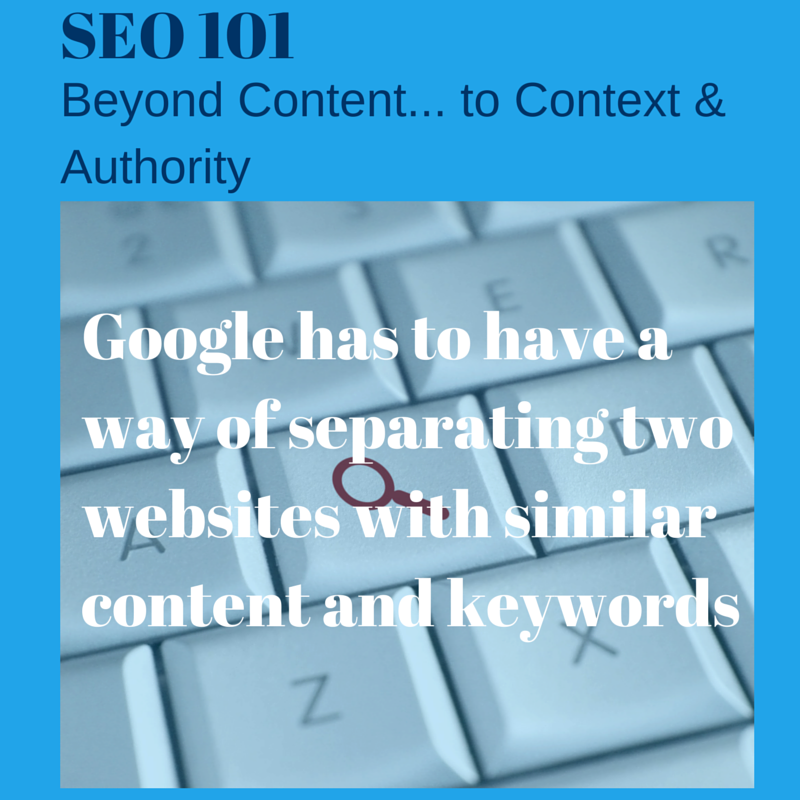 Check back next week for the conclusion of our SEO 101 series. Or, for customized advice on web design and Internet marketing, call or email the WebRevelation team today to arrange for a free consultation.